My Hope UK is a prayer-centred outreach designed to help individuals and churches share the hope of Jesus Christ right where they are. The outreach provides half-hour evangelistic films to be shown in homes, churches, cinemas, community centres, schools, prisons or other locations and used as a starting point for spiritual conversations. 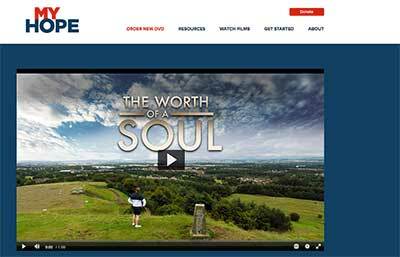 The latest film, The Worth of a Soul features a compelling, powerful gospel message from Franklin Graham along with life-changing testimonies from three British Christians. Ross McIntyre, from Livingston Scotland, was convicted of manslaughter after a car crash. Hannah Clarkson, from Hereford, was a teenage addict trying to overcome abuse. Rahil Patel was talent-spotted in London by a global Hindu guru before training as a Hindu priest in India for six years. Each of their gripping stories are included in this half-hour short film. My Hope UK also offer prayer cards, a support guide and Living in Christ book for new believers to give churches additional tools to reach their communities with the good news of Jesus Christ. UK church leaders who have partnered with BGEA UK in recent years have said they often find themselves struggling for the time to lead evangelism, so the free resources provided by My Hope UK often come as a huge encouragement. The Billy Graham Evangelistic Association is encouraging churches to hold showings of The Worth of a Soul over the Easter period. Sub-titles are available in Polish, Eastern Punjabi, Arabic, Farsi, Urdu, Simplified Chinese, Welsh and English. A DVD can be ordered, free for each church, ministry and household at: myhopewithbillygraham.org.uk, by emailing myhope@bgea.org.uk, or calling 0208 559 0342.